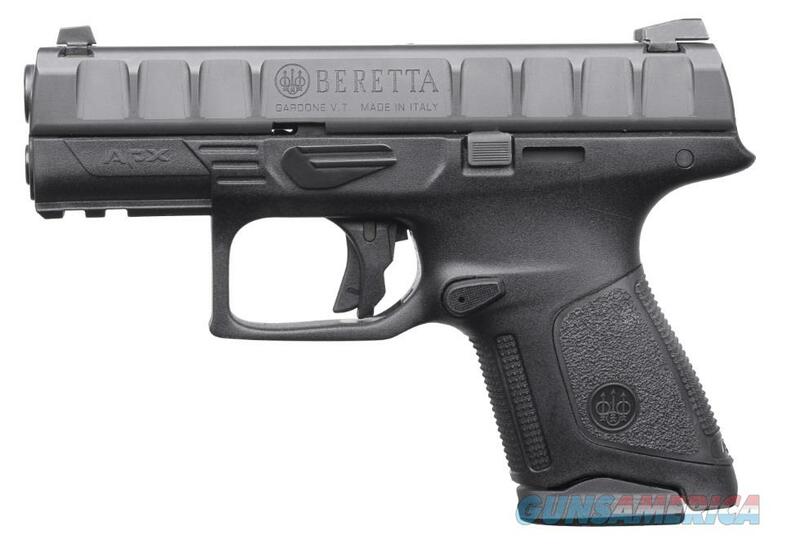 Description: The Beretta's APX is designed specifically for military and law enforcement operators. It delivers superior performance in durability and reliability, ergonomics, trigger, and modularity. It utilizes a removable, serialized chassis frame, striker fire operating system, interchangeable back straps, full length slide serrations, reversible magazine release, and an ambidextrous slide stop. The APX Compact pistol extends the proven APX Series to a concealed carry friendly size. It features a flush fit magazine and can accept the Full/Centurion size APX magazines as well. The APX Compact also utilizes a low bore axis, ambidextrous slide catch, and a trigger that breaks at 6 lbs with a clear tactile and audible short reset. This model has a 3.7" barrel, black frame and slide finish, and comes with a 10-round magazine.